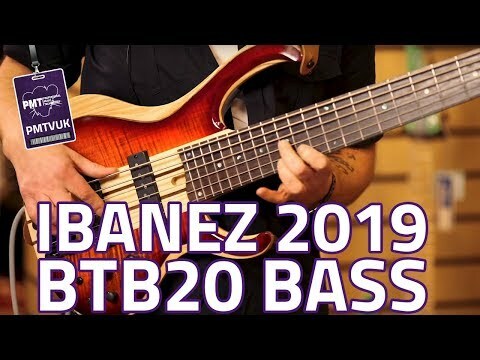 To celebrate two illustrious decades since the launch of the fabulous BTB bass, the amazing Ibanez BTB 20th Anniv Celebration 5-String Blue ..
To celebrate two illustrious decades since the launch of the fabulous BTB bass, the amazing Ibanez BTB 20th Anniv Celebration 5-String Blue Reef Gradation has landed. Crafted from some of the finest materials, and specially designed to offer Ibanez enthusiasts the chance at owning a boutique-style bass at a reasonable price, the BTB was a big hit the world over. Now, the BTB20TH5 is a welcome limited edition entry into the lineup, and continues the trend set by its forebears with style. Featuring a neck-through construction of Maple and Walnut, topped with a Panga Panga fretboard, and flanked by Ash/Okoume wings capped with a Flame Maple top, the BTB20TH5 offers a massive amount of natural sustain and a full, resonant voice. In addition to this there's a cutting edge MR5S bridge to offer the maximum amount of interference-free string transference, and the frets are made from stainless steel, offering an improved playing feel and increased longevity. As a finishing touch, the bass is coated in a gorgeous Blue Reef Gradation finish. Renowned for perfectly combining a full-bodied, powerful, and aggressive tonal texture with the articulation of a Single Coil pickup, the soapbar-like Nordstrand "Big Single" is the perfect choice for this BTB bass. Complimenting the pickups is an Ibanez Custom Electronics 3-band EQ with a 3-way Mid-Frequency switch. This EQ allows you to shape your sound accordingly, with the Mid-Switch offering tonal variations that can enhance simple chord-work as well as complex soloing. Get in touch with our Online Sales Team or your local PMT Store now to discuss the availability of this stunning bass guitar. Don't forget, if you order online now you can make use of our Home Delivery or Store Pickup services once the bass becomes available!